They are hip, awesome and happening and they are not afraid to party, take selfies and date on college campus. No I am not talking about average college-goers. I am talking about the flirty Stark, the selfie-obsessed party-loving Wasp, the classy Loki, and the burly and brash Hulk. 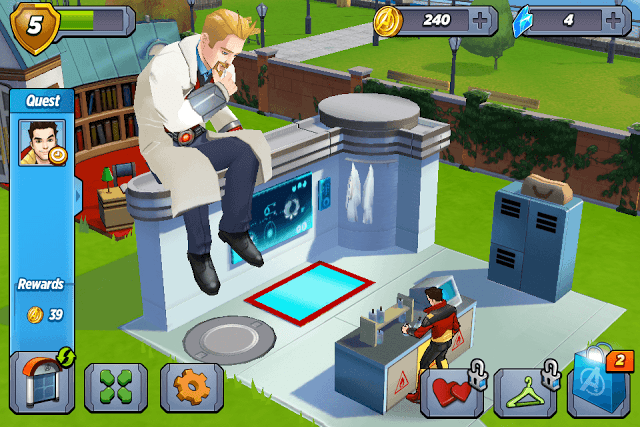 TinyCo’s Avengers Academy has these and several of your favorite Marvel superheroes re-imagined as teenage college-goers. The game’s is a city-builder that lets you build and run a college for teenage superheroes. But if you want a more action-packed game, then you should check our Marvel Future Fight guide. 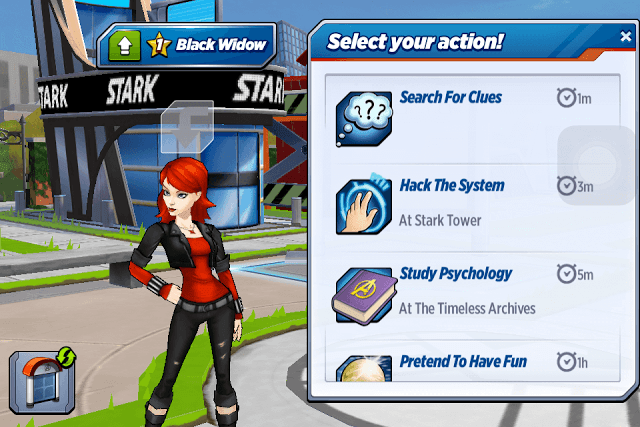 You will recruit characters from the Marvel universe and complete actions to unearth the secrets of Nick Fury’s special academy. The actions-based gameplay is pretty popular and has been implemented in several mobile games, such as Harry Potter: Hogwarts Mystery. Check out our guide to know more about this new game. Don’t leave Avengers Academy students idle. Keep them busy. By assigning actions to all recruited heroes, you will complete tasks faster. If a hero has completed an action, quickly assign another mission to him (if available). Tap on the mission icon at the bottom-left corner of the screen to check available missions/quests. Next, tap on a mission top check the total time required to complete it. Check available missions on the white board and quests on the blue board and then decide what tasks should go to your idle heroes. If there are several missions and quests that require multiple heroes, then divide tasks among them. You may assign the main quest to one hero and side-missions to others. Don’t go assigning main quests to all heroes. Keep some heroes free for quick side-missions. White board side-missions range from “Easy” to Difficult. Harder missions take more time to complete. Tap on a mission to know how many minutes it will take to complete it. The ones with the “Easy” label above them usually take 1 to 5 minutes. Try completing them first and then go for hard missions. You will need plenty of Academy credits to construct and upgrade buildings, and the best way to earn them quickly is to attempt all Easy missions on the white board. If you don’t have any easy mission left, compare the time required for completing missions on the white board with the time required to complete main quests. Also, note down the rewards. If the main quest offers more rewards and requires less time to complete, begin that quest. If missions give more coins, then start assigning missions to your idle heroes. Easy missions will take few minutes to complete. While the rewards for easy missions are usually lower than hard missions and quests, they are available in plenty. You can earn 10-12 academy credits (sometimes more) and some XP on completion. In a nutshell, make sure all heroes and busy with some tasks. As you progress, you will recruit more heroes. Additional tasks will be unlocked when you construct new buildings and upgrade them. Reach Academy level 6 to unlock Van Dyne’s Outfits. It costs around 600 credits. The building lets you unlock new costumes for your heroes. Outfitting your heroes with the snazziest costumes not only unlocks new actions, but also speeds up select time-consuming actions. 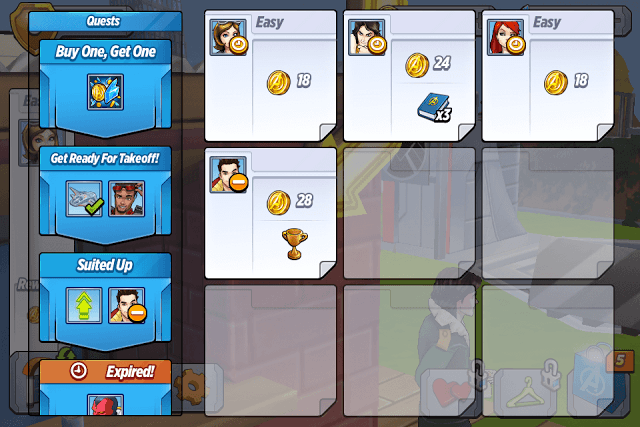 For example, buying the “Business Time Tony” costume (requires Academy level 7 to unlock) for Van Dyne’s outfit will reduce the “Talk to J.A.R.V.I.S.” action by 1 hour 30 minutes. Using Van Dyne’s outfit is another great way to complete missions faster. Each hero has a certain “action” that needs to be dragged over to him to complete a mission. Every action has a countdown timer. Some actions take less time to complete, whereas others take an hour or so. Tap on a hero to view actions and the time taken to complete them. Unlocking new actions throws new ways to earn credits and XP and gives players access to a wide variety of new tasks, including easier ones that take a few minutes to complete. With more actions unlocked, the mission board will be populated with additional side-missions. More actions unlocked, more credits and XP. To unlock new actions for your recruited heroes, you will need to upgrade existing buildings or build new buildings. Tap on the blue handbag at the bottom-left corner of the screen and then tap on “Building”. This is where you will find a list of structures. Each structure unlocks after reaching a certain Academy level shown on the top-left corner of the screen. To check upgrades for existing buildings, tap on the “A” button beside the “Building” button. Upgrades also require reaching a certain level. For example, the Blasting Range structure can be upgraded when you reach Academy level 5. Some buildings allow more students to train once they are upgraded to a new level. The upgraded Blasting Range offers two shooting ranges, where both heroes can practice their skills. To get crystal shards faster, keep completing missions and quests to earn XP. The XP that you have collected upon completion will fill the Academy level meter located at the top-left corner of the screen. The more missions and quests you will complete, the faster the meter will fill up. Once full, you will reach a new Academy level and get free crystal shards. Reaching a new level will also unlock more buildings. Start with “Easy” missions first and then go for missions that take more time to complete. Also, upgrade buildings and purchase new structures whenever you get an opportunity. This will unlock more actions. Many such actions will also include those that take 5 or less than 5 minutes to complete. Upgrading your hero also unlocks new actions for him. Tap the blue handbag and go to “Character” to check which hero is available for upgrade. Ranking up a Marvel superhero not only unlocks a new action but also provides bonus credits. For example, a rank 3 Iron Man will give you 20 Percent extra credits on missions, which means you will get 20 percent extra coins whenever you complete a mission. To unlock hero upgrades, you will have to reach a certain level. Also, to rank up a character, you will have to complete certain requirements, including collecting items and spending credits. Information about each hero upgrade can be found in the “Character” section. Captain America: Start the Cap’s S.H.I.E.L.D. part 4 quest to unlock this character. Ms. Marvel: Start the Freak Out quest to unlock this character. Task Master: Start the Task at Hand quest to unlock this character. Ant Man: Start the Ant-Plan quest to unlock this character. Maria Hill: Start the Student of S.H.I.E.L.D. to unlock this character. To move a structure, tap on the move icon (green arrows) at the bottom of the screen, and then press and drag a structure that you want to move to a different area. With move activated, you can also build paths to connect buildings. Tap on the tile icon at the top-left corner of the game screen and then tap on grass to build paths. Once a character is unlocked, invite him/her and then complete a set of requirements to recruit them. These include collecting some special items. The items can be collected by completing side-missions that appear on the white board. You can keep track of your collected items by tapping on the Inventory building.